My hair had not been feeling the love lately, I don’t know if this is a thing for anyone else but my hair seems to ‘get used’ to hair products after a while and is left feeling a little sad. 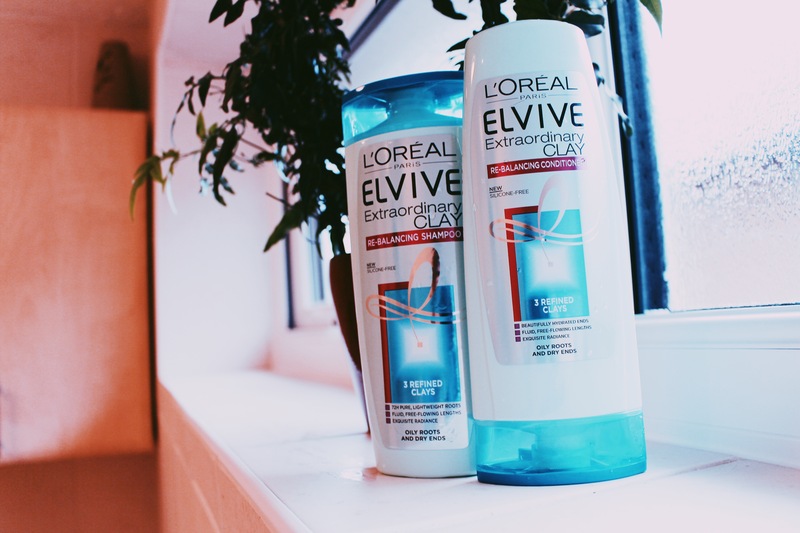 I’d been after a shampoo and conditioner to give my hair a special lift – this is when I came across L’Oreal Paris Elvive Extraordinary Clay Re-Balancing Shampoo & Conditioner. I wanted to share my thoughts with you guys as I’ve totally fallen in love with these products. I’d seen a few bloggers talking about this shampoo & conditioner, I was a little sceptical but I wanted to try them out. My hair gets oily so quickly and yet the ends get really dry and tangled. I’ve also been getting a lot of frizz lately so I really needed something to help it out. If I’m being honest, I’ve never really got on with L’Oreal hair products in the past as they tend to weigh my hair down and make the oil problem even worse. However, these products were promising exactly what I needed; the shampoo is meant to deeply purify your scalp leaving it oil free and fresh for longer and the conditioner claims to hydrate your ends, making them soft, shiny and frizz free. Before I buy products I always read up on reviews to see if others thought it was worth buying and a massive amount of reviewers seemed to be super happy with their results. I just had to give them a try. I worked the shampoo into my roots and the first thing I noticed was that a little bit of product really does go a long way with this shampoo. The formula is really thick and I have quite thick hair but I only needed a small amount. Then I applied the conditioner to just the ends of my hair, again I was able to use way less conditioner than I do with some other conditioners. These products smell absolutely amazing, I’m really bad at describing scents but the smell is just so fresh and clean. After drying and straightening my hair it still smelt amazing. Now, I can very honestly say that these products really have changed my hair for the better. After using them just once, my hair felt so thoroughly clean and silky smooth. I literally felt like I was in a shampoo advert and I couldn’t stop running my fingers through my hair because it just felt so good. It was noticeably much easier to brush through my hair after washing it, usually I suffer from really knotty hair but this problem was pretty much eliminated. I really feel like this has saved my hair, I’ve only used it a couple of times so far and I’ve had no more frizz or unwanted oily roots. There’s also a clay hair mask treatment available as part of L’Oreal’s Clay Re-Balancing range that targets people who suffer from extremely oily roots so if that applies to you, it really could be a game changer. These products are really kind on your purse as well as they’re a lot more affordable than a lot of high-end brands but work just as well, if not better in my opinion. I paid £2.89 per product in Superdrug which I think is such a bargain for the results I got; I bought the smaller 250ml bottles but the 400ml bottles have just gone on sale for £2.50 each so you could grab yourself an even bigger bargain if you head over to the Superdrug website. Have you tried any L’Oreal hair care? "Look Incredible Beauty Box Review: July 2017"
Sounds like I need to try these! Wow these sound great – I will definitely be buying them!